Last month I wrote a post about the things I wish I knew before becoming a personal trainer. 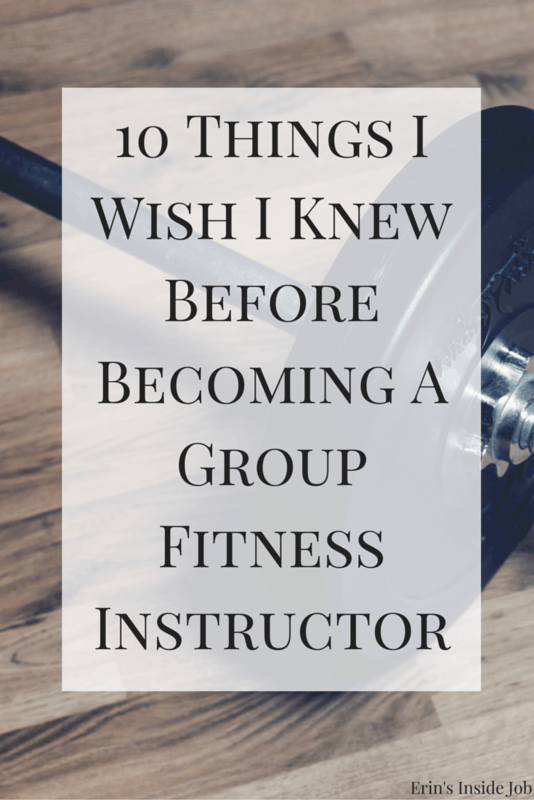 A lot of people resonated with it, so I wanted to do a slightly different one about the things I wish I knew before becoming a group fitness instructor. While they’re both related, there are several key differences. I have a habit of either jumping into things without thinking them all the way through or I try to figure out every detail and don’t do anything because I get overwhelmed. Embarking on my teaching journey fell into that first category. I love what I do, but there were definitely some things that I didn’t know when I started. I teach high-intensity interval training or bootcamps, which means that I run through the workout format, demonstrate movements, and then correct form throughout the class. This is my experience with that format, so those of you who teach more choreographed classes may have some different things to add in the comments below! I started teaching group fitness before I did personal training. I didn’t really know what to expect and hadn’t really thought the whole thing through. I figured I would teach a bunch of classes and that would be my job. If you work at a studio or a gym, there are usually a number of other coaches or instructors. There are only so many days and classes in a week, which all need to be divided between those people. This means you most likely won’t be able to make it a full time job working at one place. You can accumulate classes by teaching at more than one location, but more than likely it’ll end up as a part time or supplemental income. Whenever I attend fitness classes, the instructors always make it seem so effortless. When I actually started teaching, however, I realized there were way more things I needed to pay attention to than I realized. Making sure the music is correct, watching the clock for timing cues, reminding people of what movement they have coming next, all while trying to offer a modification for someone with an injury is a lot all at one time. Group fitness is an exercise in multi-tasking to the extreme, and thankfully I’ve gotten the hang of it as I go along. Similar to personal training, you don’t accumulate sick time when teaching group fitness. If you’re sick or go on vacation, those are classes that you lose as well as the income that goes along with it. I don’t mean this as harshly as it sounds. What I mean by no one listens to you is that often people are so involved in their own workouts that they don’t pay attention to every phrase you say. I would always worry that I could never repeat myself or people would judge me, but soon I realized (from others as well as myself), that people will pick up on those motivational cues maybe once out of every three times you say them. I thought that making playlists for my workouts would be a no-brainer and I would be done in no time. This is not the case. Finding songs that fit my class style actually takes MUCH longer than you’d think. You then have to think about warm up and cool down songs and plan the playlist in such a way that the music builds to a certain point in the workout when people need those beats to help carry them through to the end. I can’t even imagine how long spinning playlists take to create because they are so beat-dependent. Props to you guys. Along the same lines as the playlists, writing actual workouts takes more time than I originally thought. The workouts at Sweat are all preprogrammed for us, but now that I have taken on this corporate role, I need to write my own workouts for the week. I teach at least six different classes, so I need to make sure that each one is different both in movements and format to avoid doing many of the same moves during the week. When teaching classes, it’s easy to fall into the same warm up and cool down routine. It’s something we know and doesn’t require you to think much about it. The same goes for the motivational phrases used throughout the class. I have a whole bank of different ones that I pull from, but after awhile it feels like I’m always saying the same things. The better I know the people in my class, the more I can converse with them, see how they’re progressing, and just have a good time during class. I try and make a point to get to know people I see regularly so that way I can help advise them on weight choices and be able to motivate them directly while the workout is going on. The job of a group fitness instructor is to teach and motivate you through the class. Sure, you can show up as an instructor and give a lackluster performance, but chances are slim that you will get good reviews or return visits. No matter what kind of day you’re having, you need to be able to switch on your instructor persona and provide the best workout you can for those people paying you for it. Classpass, for example, requires that their members rate their instructor after every class they take. Poor ratings not only make you look bad, but also the studio as a whole. It’s important to be fully present during class and provide the best service you can, even if you’re having an off day. Before working in the fitness industry, I felt like things like massage were frivolous expenditures. Now that my job depends on the health of my body, I see how important it is to take care of it on a regular basis. The fact that I injured my back and still need other people to demonstrate movements for me over a week later means I’m not able to do my job to the best of my ability. I’m stubborn when it comes to doctors and things like stretching until something serious comes up, but as I get older and continue in this field, self-care is something I need to make a priority. This is still a lesson I’m learning, but this injury is making me shift some priorities around. Rather than sit and let an injury go away on its own without knowing what caused it, I made an sports injury appointment in order to avoid this type of thing in the future. I go in today, so hopefully I’ll have some news for you in Friday’s post! Are you a fitness instructor? Do you have anything to add? What’s your impression of fitness instructors? I made another a spin playlist yesterday but I have a truck to it! I actually get the music and routine in my head while working out myself and then later go back and fine tune with the cuing etc. It breaks it up and makes it a lot easier. I meant trick not truck lol! Oh yeah that’s a good plan! Aw thanks Allison! So glad you’ve become a familiar face! This is 100% spot on! Excellent post. I have experienced all of the same thoughts and as an instructor and trainer. I’m about to start teaching 3 Jillian Michaels BODYSHRED classes a week, I’m a little rusty at teaching. This post came right on time, thanks Erin. Oh good I’m glad it helped! Woo good luck with those classes! Are they ones you have to do the entire routine with the class? It’s always worth it to help other people on their journey! If you’re ever in the city, let me know and I’ll get you a free class! I used to think that I wanted to teach group fitness – but after getting to know trainers betters and just taking group fitness classes for a few years – I am not so sure! Haha. I have a lot of respect for trainers who do! From being subject to other peoples schedule, to making up the workouts, to managing likely a wide range of fitness abilities in every class, to having constant energy and encouragement… it’s a tough job. It definitely gets easier though. Now that I’ve done it for awhile, it’s easier to write workouts and to have a feel for timing and things. At the begin gin I was so busy overthinking that I made it more stressful on myself! Completely relating, Jan 20 was my one year as Zumba instructor, an after 10 months my students were ready to see me teaching another format. Needless to say i picked up an aerobics and weights class, yea I learned fast that, fitness class routines are much more difficult than non-verbal dancing routines!! wow. yes. i do over think the workouts, im so eager to have 3 years of routines in my pocket! After reviewing your site, speaking with fitness mentors and gurus, I’m growing patience with learning one fitness class format at a time and developing multiple routines there before moving on! Yay! So glad you’re growing in your teaching! This comment has nothing to do with today’s post but I just started subscribing to your blog on my feedly and so far I am so impressed. I listened to your podcast and realize I have lots in common with you though I am still struggling with the painkiller addiction as well as “disorders”. It is inspiring to read your story and find hope that there is another way to live. Thank you so much for your kind words; they mean a lot! I was seriously looking into becoming a fitness instructor because it sounded so “fun,” but I totally can see how it looks effortless but isn’t. I got into photography instead, which is proving to be just as not-so-glamorous behind the scenes but is also one of those professions that looks easy when you don’t see what it takes to really do it. Photography is also one of those things that can hardly ever be your sole source of income. I was shocked to find out what some of my group fitness instructor friends were making. It was almost not worth it for them to even teach! Totally. It was an increase in pay from my admin days, but definitely not enough to support myself. As someone considering getting my group fitness cert, this is awesome to read! I can sympathize with how long it probably takes to create the workout as I used to have to choreograph dances which also takes forever! Oh yeah I can imagine! It gets easier, but since it was all new in the beginning it took a lot longer. This was a great read, and spot on! I’ve been teaching fitness classes for several years now (I teach a bunch of pre-choreographed classes now like BODYPUMP, Les Mills GRIT, POP Pilates & others), and the points about knowing your class, prepping for classes taking more time than you think, and being present are SO true. I have a blast teaching because we’re all in it together, and I know my classes. I try hard to introduce myself to new people, check in with how races & other personal things are going, and say names during class (to those who like it), and I’ve noticed that people love all of this. The community it builds is basically magical! Annette Perkins recently posted…What is Life like without Social Media? Isn’t it great?! Props to you for teaching those classes. I was always worried about having to do the whole workout with them, but it’s prob just fear of the unknown haha. See, this is why I could never be a fitness instructor (even though my BodyPump instructors keep encouraging me to get certified – pretty sure they’re telling all the “regulars” that, not just me, to keep the class going). Do it. Also, I didn’t mean to dissuade anyone from doing it, just want to manage expectations. Definitely get certified if its something you want to do! This is awesome Erin. Until July I can only sub to teach yoga but I can already tell that several of these would fit a “10 Things I Wish I Knew Before Becoming a Yoga Teacher” post. Not that knowing it all before would change anything. I love it! Right?? I was like there’s a million songs to choose from; it’ll be a piece of cake! Wrong. You may also want to check and see if any studios offer work/training exchanges. See if you could work a few hours at the studio in exchange for attending training. Yes! You nailed it on all counts! I just started teaching cycle classes in May and whoaaaaaaa what a dose of reality I got. I spent hours upon hours making playlists and choreographing each class, and if I taught more than 2 that was my whole week! I finally communicated with my manager and she helped me get better organized. My perfectionist self really came out and I was obsessing too much on each class being amazing and fun. But you’re right. Many people don’t care about those details I was spending so much time on. I found that classes went better when I tried a little less and had fun, rather than trying to be this super cycle instructor drill sergeant! I love the students and just want to give the best experience possible but I know I need to manage my time better. It shouldn’t take me 6 hours to prep for a 1 hour class. It does but I’m working on it. Lol. Work in progress!! Great post! I don’t envy you for having to figure out those cycling playlists. It gives me anxiety just thinking about it! Yeah! I had one of our interns teach my class the other day and someone came up and said that they wished I was teaching. People definitely get used to one person or way of doing things and don’t like that change! I read this blog a minute ago and scrolled past your comment about teaching and working in the corporate world. Do you have any tips for someone who wants to teach group fitness but also still has an 8:30-5 job? Hi Tessa! Yes, I definitely think it’s worthy to start teaching group fitness as a side hobby while keeping your day job. Early morning classes, evenings and weekends are the best. If you know the type of class you want to teach, attend it REGULARLY and get as good as you can. It’s best to be proficient in the style you like before getting certified in it. But remember, that it takes a lot of time to practice and prepare for classes. I will write a post on my own blog on this topic soon because I get a lot of questions about how I do it. Good luck!! Remember, time management is key and if you’re okay with giving up free time to practice and teach, you can do it! I don’t have anything to add….you covered all the bases! Hahaha you are right – NO ONE LISTENS. No matter how many different ways I say a safety cue, hardly anyone actually hears me. Haha totally. Then I have to go over and fix them. IN THE ZONE. This is great! I’ve run into instructors who tell me i spend too much time on my playlists for spin class. Sometimes i really do make a science project out of it, but the structure and music is so important. If I’m not on my game, how can I improve everyone else’s?? Separately, the studio owner and I are friends & I am one of her top instructors. She shares all future business plans with me including and upcoming expansion (from spin only to a wider array of classes, juice bar, retail, etc). Her plans are so exciting and she wants me to get certified in additional areas, such as barre, but I am hesitant due to some of the above! I do not have much more time in my life to teach more classes, juggling my full time job and my own workouts etc. I love my job, but I’d also love to ditch a 9-5 and just make health & fitness my life because its my passion. But I’m wondering if multiple jobs running full cylinder 24/7 could turn out to be less dependable and more exhausting. Another thing you need to think about is… health insurance! It’s definitely a tough decision and I and many other people in the industry I know have multiple gigs since it’s hard to make it a full time thing at one place unless you have a role like manager or director of something. I’d make sure to weigh the pros and cons and figure out what works best for you. Feel free to shoot me an email if you ever want to talk about it!